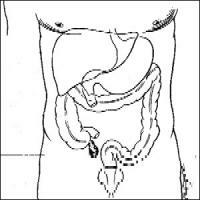 Appendicitis occurs when the appendix becomes blocked, often by stool, a foreign body, or cancer. Blockage may also occur from infection, since the appendix swells in response to any infection in the body. Report to your doctor if you have the previously described pain. Do not eat, drink, or use any pain remedies, antacids, laxatives, or heating pads, which can cause an inflamed appendix to rupture.